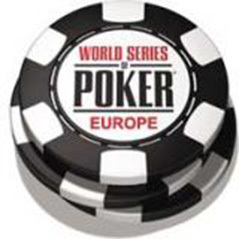 Nicolas Levi is one of the shorter stacks at the World Series of Poker Europe final table - or at least he was before doubling up at the expense of UK pro and WPT/EPT/WSOP champion Roland de Wolfe. Levi moved all-in over a pre-flop raise and Roland de Wolfe was the caller. He made the call quickly with As-Kh and was up against Ts-Td for a classic coinflip. The flop was Qd-9h-4s-8h-8d and Levi doubled through de Wolfe to give him more than 700,000 in chips whereas de Wolfe is knocked down to around a million. The very next hand, Marc Inizan moved in before the flop but only picked up the blinds and antes - at the 12,000/24,000/3,000 level that's a not insignificant 63,000. They're really going for it here at the WSOPE final table.